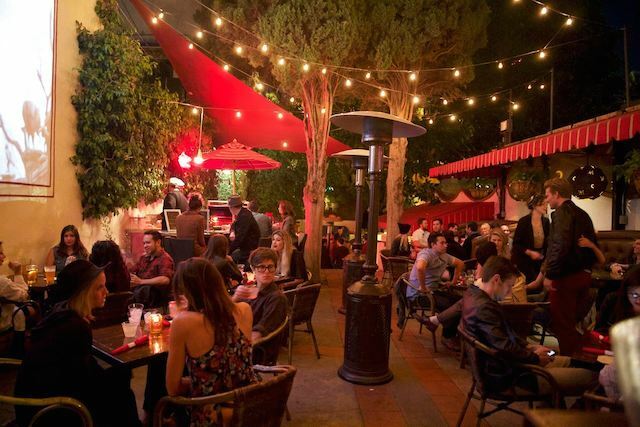 A new outdoor pop-up is launching on the patio of Silver Lake&apos;s El Cid restaurant with Mediterranean-inspired bites, cocktails made table-side and more. El Cid, the historic supper club on Sunset Blvd. known for live music and flamenco shows, will host the weekend pop-up known as La Verbena, officially beginning on April 29. The outdoor event—which draws its name from the Spanish expression for an open-air festival or street party—features a menu that includes grilled flat breads, roasted dips, skewered meats, veggies, seafood, and rotating specials. They&apos;ll also have beer, wine and cocktails, as well as music ranging from live acoustic sets to DJs, which you can enjoy between shows on the indoor stage. The pop-up&apos;s outdoor grill will be manned by chef Juvenal Rodriguez, who previously worked at the vegetarian favorite Elf Cafe just up the road, so you can expect plenty of veggie options, in addition to choices for carnivores. While the menu is still being finalized, you can likely expect shareable tapas like babaganoush with pomegranate seeds and a grilled baguette; flatbreads like one with Manchego cheese, Serrano ham, rose water, Medjool dates and micro arugula; and bigger options like a grilled flat iron steak with roasted root veggies. To drink, you&apos;ll find a great selection of craft beers on tap and in bottles, including a particular focus on Belgian-style ales, as well as an excellent wine selection. There will also be cocktails with seasonal specials and appearances from guest bartenders. La Verbena is currently having a soft opening with the official opening on April 29. It will take place Thursday to Sunday nights at El Cid, which is located at 4212 Sunset Blvd, Silver Lake, (323) 668-0318. Bonus: The historic El Cid was once the quirky Jail Cafe during the Roaring 20s.